The right telephone is the key to simplifying communications and enhancing productivity. That's why a range of telephones are available with the Avaya Partner, Definity, and Merlin Legend phone systems. From the intuitive layout of buttons and screens to the feel of the buttons as you push them, Avaya phones are designed to help you and your employees work more efficiently. Avaya's 6200 series analog telephones have all the style, features, quality and competitive pricing you've been looking for. Reliable performance and convenient functionality in a single-line analog telephone created with your communications needs in mind. Available in gray or white, these phones have a sleek, contemporary appearance that go well in any surroundings. 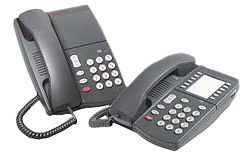 The 6200 series phones are designed to integrate with Partner, Definity, Merlin Legend phone system platforms.